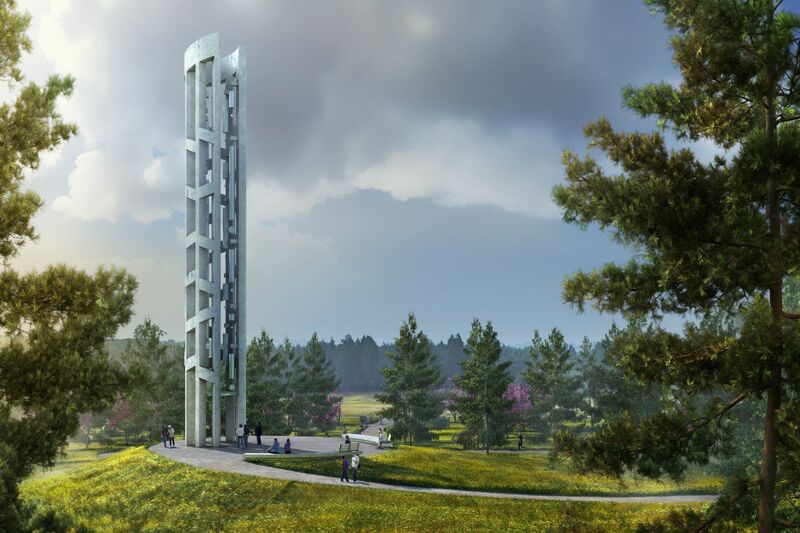 The Tower of Voices, a 93-foot tower, is outfitted with 40 wind chimes, each emitting a different tone, one for each victim in the crash, will sit near the entrance to the visitor's center. Were you able to take advantage of the third annual Philly Free Streets on North Broad this weekend? It looks like it was another successful year of biking, skating and walking without a car in sight. If only we could have that every day… But back to reality: we're right in the middle of the dog days of summer, and for many college students, they're the dog days of hunger, too. At Temple University, at least, a food pantry is making a big difference while school is out. When the fall returns, a new memorial to United Flight 93 will open in Somerset County, but the story behind its design is inspired by Philadelphia. A new memorial honoring the lives lost in the United Flight 93 crash in Somerset County on 9/11 is set to be finished this fall, in time for the 17th anniversary of the terror attacks. The striking memorial consists of a 93-foot concrete belfry with 40 wind chimes — one for each life lost that day. Because of the actions of the passengers and crew aboard that plane, an attack on the U.S. Capitol was thwarted. Its unique structure was designed by a former Philadelphia architect who says his roots directly inspired the memorial. Across the country, food pantries are popping up on university campuses to help students when financial aid and other campus resources fall short. One recent study found 36 percent of college and university students have limited access to consistent, adequate, and nutritious meals. For these students, summer can be a difficult time as campus resources close and free meals are harder to find. But Temple University's nearly eight-month-old food pantry has been saving the day for students looking for low-cost or free ways to eat this season. For the third year in a row, Philly Free Streets allowed a long stretch of the city's streets to become a playground for pedestrians, cyclists, skateboarders and more — no cars allowed. The annual event was inspired by the peace and quiet of the city's empty streets when Pope Francis came to town in 2015. The all-too-brief respite from honking horns and traffic lasted from 8 a.m. to 1 p.m. Saturday as people-watchers, chalk-artists, and dogs took to North Broad. Mayor Kenney was there, too. His final destination? A cheesesteak at Max's. The Pennsylvania Supreme Court has set a Tuesday deadline for the release of a redacted grand jury report on sexual abuse and cover-ups in six of the state's Catholic dioceses. Here's what we know so far. A small number of white supremacists and members of other far-right groups showed up for a "white civil rights rally" in Washington D.C. yesterday, one year after protests in Charlottesville, Va. turned deadly. They were dwarfed by counter-protesters from at least 40 anti-racism groups. The stabbing death of a homeless man at Jefferson Station Thursday has put a challenge for SEPTA police in high relief: balancing security with compassion. Inaccurate property tax assessments continue to be a problem in the Philadelphia region. In Chester County, volunteers at a local food pantry are helping mobile-home owners fight back. The Eagles' preseason opener loss did nothing to dampen fans' spirits. A full 35,000 of them attended an open practice at Lincoln Financial Field Saturday. Yes, practice. To be fair, Super Bowl MVP Nick Foles had returned. It's not just the business school: Temple University says reports from two other schools submitted to the U.S. News and World Report's college rankings included errors. Get it? Fishtown? Thanks, @billycress. Each day of the summer, in neighborhoods across the city, volunteers block off a street just so local children can play. Philly's 50-year-old Playstreets program provides snacks, toys, and a haven from poverty and drugs. If you'd call yourself financially literate, consider using your skills to help others. A local nonprofit is looking for volunteer coaches to help small businesses. We told you last week about therapy goats helping to landscape East Germantown. In the suburbs, there are goats and sheep helping to maintain the land. Amazing. Rejoice, foodies: South Philly Barbacoa, a legendary taqueria that started as a food cart and became a James Beard Award-nominated restaurant, has a brand new location. Philly has hit a bit of a boutique fitness studio boom. But the pricey classes have become a symbol of wealth, and they're only popping up in certain neighborhoods. Does just thinking about working out make you anxious? Try stress-reducing exercises to ease the effects of tension on your body. "This blood is on America's hands, as long as we keep sending the bombs that kill so many Yemenis, and as long as we give the Saudis our unqualified diplomatic support in a messy regional conflict." — Columnist Will Bunch on the deadly bombing of a school bus full of children in Yemen, part of America’s “forever war” around the world, he writes. It is vital that children enter the fourth grade reading on grade level, and too many Philadelphia children aren't — but it can change, writes Jenny Bogoni, executive director of Read by 4th. A GOP-backed bill to take away the firearms of domestic abusers failed in the Pennsylvania House because, columnist Maria Panaritis writes, Republicans sided with gun lobbyists. A hard look at the Philadelphia police officers who have been named in hundreds of civilian complaints, compiled by City & State PA and Philadelphia Weekly, makes for a disturbing, if important, read. The Philadelphia Citizen's story on local veterans that are making a difference in Philadelphia by volunteering their time will cheer you up today. There's a place called New Philadelphia in Ohio and, as Billy Penn reports, it's just like the original Philly in a lot of ways. They even have a double-take-worthy replica of Independence Hall. It feels like local sports power couple and living #RelationshipGoals Julie and Zach Ertz are everywhere lately. Can't get enough? Luckily Philadelphia Magazine is next with a story on their adorable union. When school lets out, kids have summer camp. When pop stars need new songs, they have songwriting camp. Vulture's inside look at modern hit factories will have you overthinking every "song of the summer." The statue of William Penn has stood atop City Hall for 124 years, long before the building at right went up. Why does the 26.5-ton bronze sculpture of William Penn atop City Hall face the northeast? That wasn't the sculptor's original plan.